Newage Testing Instruments provides an assortment of accessories for all your Brinell testing. The following are list of the most common accessories available. Cabinet, bench, metal for 9000 Series tester. Brinell Scope, pocket-style, 20X, fixed focus with carrying case. Brinell Scope, HiLight style, 20X, adjustable focus with carrying case, 0.01mm resolution (special order). Brinell Scope, HiLight style, 20X, adjustable focus with carrying case, 0.05mm resolution. Shroud, penetrator with swivel mount, complete assembly. Washer, for nosepiece penetrator shroud, plastic. Adapter, for testing inside diameter, includes ball holding anvil and ram cap. Adapter, chain for existing heads, 4’ (1.2m). 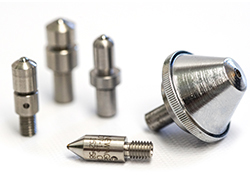 Adapter, for 5mm ball, with carbide ball. Hydraulic oil, SAE 50, 1 quart. Indenter, regular, operates in HB100 – HB500 range. Indenter, carbide, operates in HB300 – HB730 range. Bench support, for CPST static clamp. Hammer, flat face, 3 lb. Handle, for CPIT impact tester.